19.00-21.00, The Ratiu Foundation / Romanian Cultural Centre Manchester Square, 18 Fitzhardinge Street, London W1H 6EQ; Tel. 020 7486 0295, ext 108 e-mail: bookings@romanianculturalcentre.org.uk; Entry is free but booking is essential. Open from Monday 4 July to Tuesday 19 July 2011, Mon � Fri 12.00 � 18.00. Admission free, booking is essential The merging of tradition and modernity was a constant preoccupation of many artists and designers. Furniture designer Simona Stoicescu, founder of Black Bird Creators and also a painter, together with her friend, sculptor and designer Oana Gyarmath � author of the collection on display � were inspired by Romanian traditional motifs and brought to life a series of functional art objects which sometime include vintage, authentic pieces of traditional Romanian folk costume. On the evening of 4 July, the presentation of the works on show will be made by Simona Stoicescu. She will be introduced by novelist, historian and curator Dr Mike Phillips OBE, convenor of the Culture Power series. The Love Tradition collection was inspired by, and is dedicated to, the memory of Queen Marie of Romania. A grand-daughter of Queen Victoria married to King Ferdinand of Romania, Marie has proved the love for her adopted country by embracing and assimilating the Romanian people�s traditions, her contribution and dedication to promoting arts and heritage being tremendous and hard to equal. Black Bird Creators� artistic work is a two-way journey between the archaic and the contemporary, a fundamental quest for the primary source of art, and an effort to promote Romanian artistic tradition and modernity in the same time. 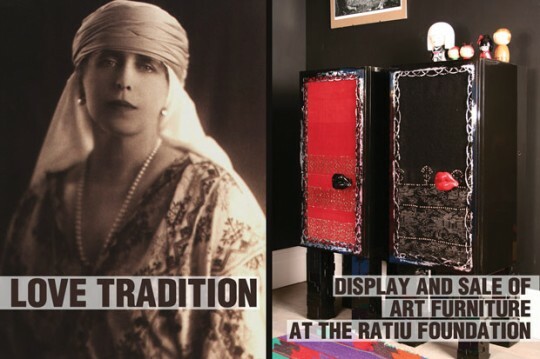 The objects exhibited at the Ratiu Foundation are on sale, part of the proceeds going to support the Ratiu Foundation�s restoration and heritage work in Romania. // // // // // // // // // // // // Dr Mike Phillips OBE is a novelist, historian and curator, consultant to various cultural organisations across Europe. Organised by The Ratiu Foundation / Romanian Cultural Centre in London. Culture Power is a programme initiated by the Ratiu Foundation, consisting of a number of presentations and constructive dialogue with an invited audience. With the support of Profusion International Creative Consultancy. Note: Image of Queen Marie and art furniture � Courtesy of Black Bird Creators.